Pigs are clean, intelligent, and entertaining animals. Because they are domesticated animals, they are not even as unusual a pet as a hedgehog or snake. The animal lover that buys a pig on impulse, however, is likely to have a disappointing experience. Those who acquire a pet pig with the most common preconceived, but inaccurate notions, are even more likely to be quickly disenchanted with their "exotic pet." Many pet owners will complain of the size that their pig attains; but if the pig were more manageable and better behaved, its ultimate size would probably be of less concern. 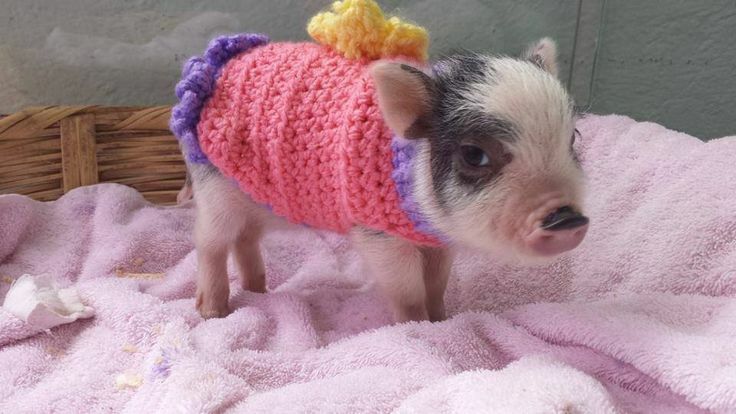 Given the proper environment, education, diet and veterinary care, the mini pig can be a terrific pet. Any pig who is acting differently needs an exam or assessment, even by you, to rule out illness as the cause for a change in behavior. If this has been gradual, odds are, there has been a progressive behavioral problem, but if it is a sudden change, check for a fever, check for lesions on the body that could indicate something far more serious that a pig just being a brat. If there are other medical symptoms in addition to the behaviors, call your vet. If you don't have a vet, click here for a list of vets that will see pigs. What is the best treatment for a spoiled pig? PREVENTION! You do not have to worry about stopping something you never started. Spoiled Pig Syndrome is actually a catch-all term that covers a wide spectrum of behavioral problems with pigs. It can vary quite a bit from pig to pig, but in general, is related to accidental reinforcement of unwanted behaviors in addition to the following: a lack of leadership from the owner, lack of clear expectations for the pig, inconsistent or changing rules for the pig, and inconsistent or incorrect use of aversives and punishment based training methods. Pigs that fall into the category of SPS are often pushy and aggressive – the were likely given free reign to do whatever they wanted as piglets. They see people as food-dispensers and have no manners or boundaries. They don’t understand how to behave appropriately because accidental reinforcement of problem behaviors is occurring. The problem is compounded because often, the first line of correction is punishment-based. Remember that pigs are NOT mind-readers and they don’t inherently know the proper way to interact with people! If we only tell the pig ‘no’ when she’s doing something wrong, she STILL won’t know what she should be doing instead! By using force and punishment, she simply now understands that these pushy behaviors might well lead either to treats OR punishment. It makes for a highly reactive, aggressive pig, who is still probably badly-behaved. These pigs become highly anxious because they don’t understand clearly what’s expected of them and they never know whether that behavior will lead to treats or punishment. Remember that Spoiled Pig Syndrome is often more than one issue and in order to successfully resolve it, we must clearly define the problems. If the pig has not yet developed aggressive behaviors, it can be as simple as tightening up the routine, clearly defining expectations for the pig, and being diligent about avoiding accidental reinforcers. Once aggression develops, the help of a trainer or behaviorist is essential - resolving the problem may require not only redefining the routine and eliminating accidental reinforcers, but may also need to include desensitizing and counter conditioning in order to resolve defensive and aggressive behaviors. Please contact a professional for assistance before beginning any behavior modification program. However, there are some who experience behavioral problems with their porcine companion. Although the phrase "spoiled pig syndrome" is a phrase coined by Dr. Valarie Tynes, DVM, during her research of pet pigs, it is likely something most pig parents are quite familiar with as this tends to rear its ugly head at some point when you have a pet pig. Often times, it isn't the pigs fault they lack manners and respect, but rather the caretakers fault. Pigs typically have us trained way before we train them. A classic example is a pig that wants to get up and eat at 6am. That pig will squeal and make all kinds of ruckus to let you know they're awake and ready to get the day going...BUT, when you get up and do exactly what your pig wanted, your pig knows this and will test the threshold and try again tomorrow, only at 530am instead of 6am. What normally happens is that the time gets earlier and earlier until finally your pig keeps you up all hours of the night because you have rewarded this behavior whether that be by feeding your pig when he/she demands it or by letting him out of the crate or room when your pig decided he wanted out. Spoiled pigs lack respect for their humans. The trick is to set a schedule or routine and do not deviate from it. If you plan to feed at 7am, then do NOT feed at 630am if your pig is demanding it. Feed at 7am, just as you planned it. This may take a few days to show your pig that you mean business and have no desire to follow HIS rules, but exactly the opposite, your pig will get the message that he is NOT the boss and you will feed on YOUR schedule. (or let him out of the room, etc) Rewarding negative behavior will get you more negative behavior. Rewarding positive behavior will get you more positive responses from your pig. Untrained pigs are no fun to interact with. A pig nipping at your fingers or toes is not a desirable pet to have. YOU must train your pig. Another example of spoiled pig syndrome is the pig who doesn't really care for anyone other than you. This is normally because no one else has taken the opportunity to be involved with the day to day care of your family pet leaving only you as the treat dispenser as well as the primary caregiver. It is SUPER important that everyone in the household participate in managing your pig to create an environment suitable for everyone. Having only one person interacting with the family pig on a day to day basis can create territorial issues in addition to a spoiled pig leading to aggressive like behaviors. Jane McPherson is a zoologist with experience in behavioral management, she created the website Positively Pigs cited above. ​Dr. Valery Tynes study regarding her theory on pig aggression directed at humans can be read by downloading her study below. We have some very spoiled pet pigs that are causing frustration and agitation with otherwise understanding & tolerant piggy parents. This condition is referred to as The Spoiled Pig Syndrome (SPS). Is your pig misbehaving? Grouchy? Pigheaded? Nippy? Won’t listen to you? Then your pig could have SPS. To make change in this unfavorable behavior, we need to be in control. This behavior should not be condoned by you.. NOT NOW, NOT EVER!! What causes pigs to become spoiled and how do you prevent it from continuing? I don’t have the answers scientifically accepted as facts but I do see some similar behavior after lengthy discussions with pig owners. First I look at the physical reasons for undesirable behavior, starting with the feeding menu and schedule. Your pig could have adverse behavior based on WHAT you feed, HOW you feed, WHEN you feed, and WHO feeds. Then look at the environment the pig lives in. Does he/she have their own “get away” space? Does the pig feel threatened or disliked by a family member? Does the pig get enough fresh air and exercise? Is there unhappiness and discontent in the family? Next comes questions to determine good health. When was the pig weaned from the mother, and from the siblings? Could there be a toothache, urinary infection or anything else causing pain or discomfort? Once all the physical reasons are discussed, changed or eliminated, I take a good look at the way the pig has been socialized. The majority of problems are vastly improved when communication is established between Parents & Piggy. “Discipline” is the magic used to communicate. Put your foot down, no more Mr. Nice Guy, make the little porker behave, if not… withdraw the reward. BUT as soon as you see the behavior you are striving to get, then INSTANTLY reward. Use your voice and body language to express what you want to communicate. Training and consistency is critical for success in communicating. If we are NOT consistent, piggy will be getting mixed signals. Always use the same short phrases or single words to describe the behavior the pig is displaying. The rule here is: same phrase for same behavior… every time… by everyone in the family. Communicate with your pig through consistency, training, discipline and lots of love and you will have a great companion. Remember the pig is exceptionally intelligent and will respond in a positive manner when presented with the opportunity to be equal. Susan offers behavioral consultation services as well. You can reach her by calling (215) 322-1539 to make an appointment. Consultation advice is practical, from first hand experience. There is a fee for her services of 35.00 per hour whether that be on her farm or by phone. She will ask for alot of information and pictures to try and determine the underlying cause for the behavioral issues. So having this information up front may be helpful and provide for a more efficient appointment. It is hard to imagine anyone would be better suited to help with behavioral issues since Susan has had several hundred pigs come through her piggy day care and boarding program in addition to the pig rescue she maintains. She has been involved with pigs since they were introduced to the US. Please keep her in mind BEFORE you get "to the end of your ropes". When an intervention is made early on, there is a much higher change of your pig making the changes needed to stay in your home. Remember to train your pig before your pig trains you! Here is a short segment National Geographic did with regards to a spoiled potbellied pig. This excerpt is from a study done by Dr. Valerie Tynes regarding behaviors of pigs. The opportunities to thrive guidance serves as an exceptional framework that anyone working with animals, including exotic animal pets, can use to help support ongoing improvements in how animals are fed, housed, trained, and generally maintained. By continuously seeking to provide the optimum in animal caretaking, pet owners will at the same time be increasing the chance the pet will stay not only physically healthy but mentally and behaviorally healthy as well. 1. Opportunity for a well-balanced diet—Fresh water and a suitable species-specific diet will be provided in a way that ensures full health and vigor, both behaviorally and physically. 2. Opportunity to self-maintain—An appropriate environment including shelter and species-specific substrates that encourage opportunities to self-maintain. 3. Opportunity for optimal health—Providing supportive environments that increase the likelihood of healthy individuals as well as rapid diagnosis and treatment of injury or disease. This opportunity can equally refer to supporting physical and mental health and the ability to rapidly identify and treat disease. Chronic, unrecognized, and untreated pain is found to be an important cause of anxiety and thus a stressor for all animals, including humans. If an animal exists in an environment in which injury or illness goes unrecognized, and thus untreated, the animal has the potential to suffer the mental health and poor welfare consequences of the process. In addition, unrecognized pain is often a cause for the sudden appearance of aggressive behaviors.The sudden onset of any behavioral change, especially aggression, in an adult animal, should always be followed by a complete physical examination and collection of a minimum database to rule out illness or injury. 4. Opportunity to express species-specific behavior—Quality spaces and appropriate social groupings will be provided that encourage species-specific behaviors at natural frequencies and of appropriate diversity while meeting social and developmental needs of each species in the collection. Providing animals the opportunity to engage in species-specific behavior is important at all stages of life, including the neonatal period. In this way, animals can develop more normal responses to future life events and learn normal social cues and interactions. This can be complicated when individuals are housed in situations in which fear of humans is learned or with parents who do not have normal social behaviors. Normal social groupings in the neonatal period may be particularly critical in avian species, notably psittacines, in which it is suspected that the early life stressors associated with premature separation from siblings and parents prevent them from developing normal social behavior and may predispose them to many problem behaviors. It can take some forethought to develop environments that allow animals to express normal behaviors through all stages of their lives. Caretakers must be aware of whether the species they are acquiring is truly a species requiring social housing and the types of social groupings that are most appropriate. Providing appropriate social contact can be problematic. Social behaviors may involve antagonistic encounters and fairly sophisticated levels of understanding of the species’ behavior may be needed to properly interpret interactions and ensure individuals are not put into chronically aversive or stressful settings. Some level of social disharmony may be appropriate and acceptable and part of the normal species’ behavioral repertoire, but if it is too frequent or strong it can be a source of distress to some individuals. Human relations may provide some level of support for social needs in certain species, although with wild species, this is rarely enough for the development of normal behavioral patterns. For social species, housing in an appropriate grouping of conspecifics may be one of the most important aspects of their environment. For species that are normally solitary, housing them in social groups can be highly stressful and result in poor welfare. Having adequate size and complexity of space (with enrichment that is biologically relevant for the species) is critical to ensuring species are able to express a broad range of normal behaviors. Caregivers should be encouraged to provide the largest possible housing for the animal. For example, most cages commercially available for pet rabbits and rodents are woefully undersized and not at all conducive to good mental or physical health for the animals. Understanding the natural history of the species is necessary to evaluate appropriateness of the enclosure shape and size and enrichment offered. For instance, the enclosure size, shape, and substrate will be different for a species that is arboreal compared with a fossorial species. In addition, the learning history of the individual should be taken into account. If an individual has had little exposure to enriched or novel environmental items, the caretaker must proceed at the animal’s pace as enrichment opportunities are expanded. 5. Opportunities for choice and control—Providing conditions in which animals can exercise control and make choices to avoid suffering and distress and make behavior meaningful. It is now generally accepted that the ability to exercise choice and control is fundamental to good welfare and health in animals (including humans). Multiple studies across genuses have found similar positive behavioral and physiologic responses to environments rich in choice and control and found negative impacts when opportunities for choice and control are limited. The environment should provide opportunities to engage in a variety of behaviors that can gain positive reinforcement and support a large behavioral repertoire. In addition, the animal can make a choice to not perform a given behavior (eg, it can choose to build a nest from cotton but not shavings). A choice to not perform a behavior should carry no adverse effect, particularly when interacting with caregivers (eg, if the animal chooses to not come toward the caretaker but instead moves away, the caretaker allows the animal to move away rather than picking up the animal). Broadly speaking, creating environments that are rich in opportunities to gain positive reinforcement are recommended. This can be done by providing a highly enriched environment and engaging in deliberate training programs based on positive reinforcement. Examples of enrichment include giving the animal access to various areas, substrates, temperatures, foods, foraging opportunities, and training sessions that are based on positive reinforcement. Good welfare is created when individual animals can choose what to do to gain positive reinforcement and are free to use behavior to escape aversive situations. The general balance of interactions with the environment is such that there is a strong shift toward positive reinforcement. The use of deliberate positive reinforcement training for wild animals under professional care has increased markedly across taxa in the recent decades.Positive reinforcement training allows animals to participate willingly in their care (eg, offer body parts for examination, venipuncture, and wound treatment).Animals also learn they have choice in whether to interact with human caretakers, and this is proving to be extremely beneficial to their well-being. One recent study found that this type of formal training significantly reduced fear of humans, which in the long term would benefit welfare. There is no reason to think that this type of training would not be equally beneficial to all exotic pets. Introducing some basic positive reinforcement training will increase the amount of positive reinforcement in the environment. Other important definitions for the above article. Reinforcement is any stimulus that increases the likelihood of a behavior being repeated. Positive reinforcement involves the presentation of something that is likely to strengthen a behavior response. (It increases the likelihood that the behavior will be repeated.) This will need to be something of value to the individual. Food is often the most valuable reinforcer or animals simply because it is necessary for life. Negative reinforcement involves the removal of something unpleasant that strengthens the behavior response. A common example is an animal biting a human hand to get the hand to go away. Punishment is any stimulus that decreases the likelihood of a behavior being repeated. Positive punishment involves the application of something unpleasant or aversive, such as a shock, verbal reprimand, squirting with water, or threatening with a newspaper. Negative punishment involves the removal of something pleasant, such as play, the potential for food rewards, or social interaction. Keeping the Exotic Pet Mentally Healthy. Summary: Captive animals often have their behavior significantly constrained, including exotic pets. Major events in their lives are dictated by the schedule of the human caregiver—when food is delivered, how food is presented, how they are interacted with, control of their movements, exposure to temperature extremes, ability to respond to environmental changes, physical contact, and exposure to conspecifics. Their behavior repertoire is much smaller than a wild counterpart, and this constraint of their behavioral repertoire is theorized to be a root cause of many common behavioral problems. At the least, it is likely to stress the animal, contribute to poor mental health, predispose them to physical illness, and ultimately result in poor welfare. Veterinarians can play an integral role in improving the welfare of captive exotic pets by being informed about the role of stress in mental and physical health and the importance of providing animals with environments with choices, control, and multiple opportunities for expressing a variety of normal behavior patterns.